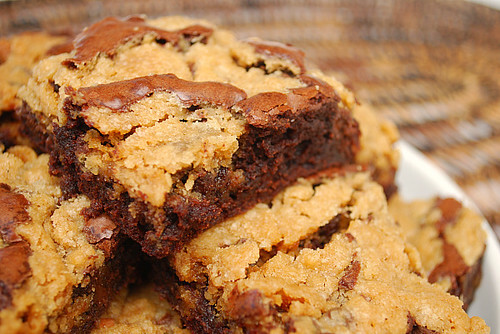 These brownies are awesome - a rich chocolate brownie base studded with a classic chocolate chip cookie dough on top! Apparently, this decadent dessert is popular on the Betty Crocker website and can be made with their boxed brownie mix and cookie mix. But since I already had ingredients on hand to make both a brownie batter and cookie dough from scratch, I saved myself a trip to the grocery store. I used a brownie recipe from About.com and made a half batch of the classic Nestle Tollhouse Chocolate Chip Cookie recipe. Either way you make it (by using the mixes or from scratch), one thing for sure is that they won't last long! I plan on making this again and for variation, I'll use different baking chips such as butterscotch, mint chocolate chips, toffee, etc and/or even use another cookie dough recipe such as peanut butter! Preheat oven to 350 degrees. Grease bottom of 13x9" baking pan. In large microwave safe bowl, combine unsweetened chocolate and butter; melt on 40% power for 2-3 minutes; stir until smooth. Beat in sugar, then eggs. Stir in flour and baking powder. Spread in prepared pan. Combine flour, baking soda and salt in small bowl. Beat butter, granulated sugar, brown sugar and vanilla extract in large mixer bowl until creamy. Add eggs, one at a time, beating well after each addition. Gradually beat in flour mixture. Stir in morsels and nuts. Drop by rounded tablespoon onto brownie batter; press down to push cookie dough slightly into brownie batter. Bake at 350 degrees for 30 to 40 minutes or until brownies are set and edges look dry. Cool completely on wire rack. p.s. we topped ours with a homemade chocolate frosting! The whole package was wonderful! Amazingly easy and really looks delicious. I'm definitely craving for a plate of that right now. Thanks for sharing this wonderful recipe. This is definitely a must do recipe this weekend.